Staying Motivated by Sticking To A Fitness Routine! Consistently staying motivated to anything in life is a constant struggle. We have so many things in our lives that we want to accomplish and often times, we end up becoming overwhelmed and complete nothing. Between work and kids and family and the many other stresses that we endure throughout our loves, it is no wonder fitness and health often take a backseat role. Fitness and health are often great stress relief techniques. If you have started a fitness routine, you are not alone. 91 percent of people that begin a workout routine quit before they planned. And if you quit within the first 7 days, once again, you are not alone. Statistics show that 62% of those who begin an fitness routine quit within the first week. But this makes no sense… don’t we all want to be healthier and look better? If you ask a random person on the street if they would want be fit and in shape, most of them will say yes. But if people want this, then why don’t they do it? Why do most people give up before really even starting? Well, that is a question that only you can answer. 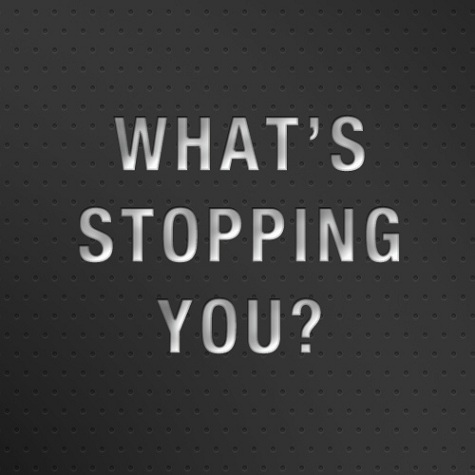 Look in the mirror and ask yourself. In this post, I just want to discuss some things that will help you maintain your workout regimen so that you can find a way to continue staying motivated. Before I give my list of tips, I just want to say that going to the gym day in and day out is by no means easy. It is grueling, tiring, draining, and exhausting. If it was fun and exciting, then everyone would be doing it. But one thing I can say, from experience, is that it is worth it. There is no better feeling in the world. When leaving the gym after a tough workout, you’ll feel like you are on top of the world. You’ll feel proud of yourself for accomplishing something and for not giving in. Be Internally Motivated: Don’t get me wrong here, external motivation can be quite the motivation, but there has to be a balance. I think the biggest mistake that people make when trying to eat better and workout is that they do it for someone/something other than themselves. When you work out and be healthy solely for yourself, keeping a fitness routine will be a lot easier. However, if you decide to be healthy because of a temporary (I say temporary because you cannot control someone else’s actions) external reason, it will be extremely difficult to maintain. For example, when the reason for your lifestyle change is trying to impress an attractive girl/guy or even trying to please your girlfriend/boyfriend’s suggestion of getting into better shape, the program will most likely fail. It will fail because your fitness regimen is a means to an end. What I mean is that you are working out with an endpoint. You are working out to get bigger for a reason that will inevitably end at one point or another. What happens when you finally get big and you don’t get that attractive girl? Does that mean you just stop working out now? Or maybe you get really strong because your girlfriend asked you to and she dumps you anyway because of other reasons. If you were working out for the “right” reasons, none of these external events would matter and they wouldn’t affect your workout . Who knows, working out may even become your outlet for the hardships in your life. Set reasonable goals: Setting goals is a great tool when staying motivated, if they are reasonable that is. Be realistic with your goals and once you attain your goal, set a new goal and continue to improve. If you are too ambitious, it may be very easy to become demotivated. Transformations take time and do not happen overnight. Arnold Schwarzenegger did not bulk up and attain the physique he did in a short period of time. It was a gradual process. So for example, if you are new to exercising, maybe a beginning goal could be to walk 10 minutes a day 3-4 days a week. Maybe a goal 1 month down the line would be to be able to walk for 20 minutes 5 days a week. And a long term goal 4-5 months in the future would be to able to finish a 5k! Create a fitness routine: This is probably the most important tip of advice. We are all busy and finding time to exercise can often be a daunting task. Sit down and look at your schedule and think of when you can find the time to workout. If you are just way too busy during the week, then workout on the weekends. If you have time after work, prepare your gym bag before work so that you can go right to the gym after work. If you know you are normally hungry after work, bring a light snack to eat on the run such as a fruit, a bar, a shake, a sandwich, etc. Eliminate all the possible excuses you may have after a long day at work. If you are like me and would rather workout before work because you know that you will just be way too exhausted after work, then workout in the morning. Make waking up early and going to the gym a part of your daily routine. Waking up early requires going to sleep earlier too. Eliminate wasteful time at night such as watching excess TV and get that much needed sleep. It may be difficult to get up early and workout, or working out after work, but once it becomes a part of your routine, you will be extremely thankful you started. You will feel better, look better, and be healthier! 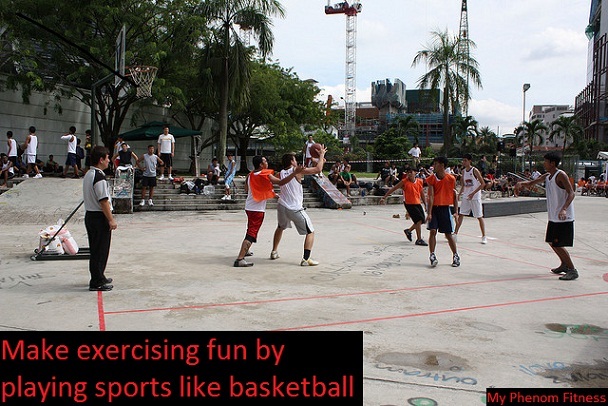 Make exercising fun! : When many people think of working out, they think of how boring and hard it is. Well I can’t help you on the exercising being hard part because well, it is. The harder you work, the more calories you will burn. But I can help you out on the boring part. Exercise does not have to be boring! Growing up we all ran around because it was fun, not because it was boring. We ran in circles; we ran after each other; we played on jungle gyms; we played sports. We didn’t do it because it was “exercise.” We did it because it was fun. Find something that you find fun and stick with it. 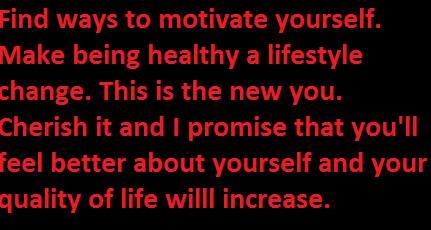 This will make being dedicated to your healthy lifestyle change much easier. If you hate lifting weights and your goal is to just be healthy and not a big muscly bodybuilder, then don’t lift weights! If instead of lifting weights, you enjoy long walks outside 0r you enjoy dancing or yoga, do that! If you hate running but love playing racket ball or basketball or football with some friends, then do that stuff. Better yet, join a flag football, volleyball, softball, or basketball league with some of your friends. It all burns calories and will help you get in great shape. What’s great about doing things you love is that it doesn’t feel like work. You do it because it is fun, and at the same time you will get in great shape! Find a workout buddy! : Sometimes all we need is a little motivation to get us going. Find a workout buddy and make a commitment to each other. I have personally been using this tip every morning and night this summer. One of my college teammates and I have been doing 2.5 hour basketball workouts every morning and lifting weights every night. There have been many days where I really just wanted not to go and take a break but, since I made a commitment, I went and ended up being really happy for doing so. Not wanting to break my commitment made it easier for me to stay motivated even when I felt drained. Take a day off: Yep, you read that right. Sometimes, we get so demotivated when we miss a day or two that we just stop completely. If your week gets hectic and you become overwhelmed, take the day or two or three off. Once you get the time again, go back to your fitness routine again. Just get back on track as soon as you can. With that being said, it is best not to ever take a day off because then eventually, if you take enough days off, you will start to think it is okay to keep missing until you stop going altogether. Don’t fall into that trap! Quality over quantity: The National Center for Health Statistics shows that only 19% of the population engage in more than 3 intense 20+ minute workout sessions. So realistically, with all of our life commitments, working out 4-7 days a week may be a little too optimistic. No need to panic however, because 3 good workout sessions per week is more than enough to get you in great shape. And try to make your workouts short and sweet. When many people think of the gym, they think of long, grueling workouts, but they don’t need to be. Make your workouts short and intense and get out. If you are working hard, 30-40 minutes is all you need. Avoid meaningless conversation and time wasting at the gym and get in and get out as soon as possible! Keep it going for 30 days! : Often times, the thought of starting a fitness routine can be somewhat overwhelming. If you start your workout regimen telling yourself that you are going to eat well and exercise for the next 365 days, you will greatly increase your chances of failing. Make a commitment for 30 days. Studies show that if you stick with something for 30 days, it can become a habit. Make a healthy lifestyle a habit. Take it one a day at a time. Even looking 3o days into the future may be daunting so make every day for your new goal. Love it and embrace and I promise you that it will be worth it. Try it out for 30 days and make it a habit. Get a social network: Surround yourself with positivity. Positive energy is a must. If friends and family are not supportive, join fitness and health forums. These can often be extremely motivating and a lot of people give some great advice on those. Whatever your mode of action, surround yourself with positive influences and create a great fitness, health-oriented social network. Tell the world: Tell your family, your friends, post it in your blog, tell the world about your new lifestyle change. No one likes to let others down. If you tell everyone about your fitness endeavors, even if you want to quit, terror and embarrassment may push you to make being healthy a habit! Surely you don’t want to let everyone down now, do you? Let others be a driving force to keep you motivated and dedicated to your routine. Enjoy yourself after the workout: When you workout your body releases endorphins that make you feel good. After every workout take a second to sit and praise yourself. Let the endorphins sink it because you, my friend, just completed a great workout and should feel great about yourself. If you are anything like me, that great feeling will have you coming back for more. I have never done any drugs in my life (besides the occasional tylenol) but if I did, I would imagine it to have similar effects as exercise. The “feel good” feeling after a workout makes staying motivated much easier. Well there you have it! I hope these motivational tips can help you change your life in a very positive way. Just remember, try to make being healthy a part of your lifestyle and fitness routine. There is no end to it. Being healthy, exercising, and eating will be the best decision you will ever make in your life. that there are so many individuals nowadays that don’t care at all about consuming foods that are healthy or worry about keeping fit. For me as well.. not many things in this world that are a higher priority than my health. “health” is a long process and I don’t believe that people do not want to be healthy because most, if not all do, but many people do not want to actually exert the effort and hard work needed for a healthy lifestyle. Health is a process and a lifestyle and takes a lot of dedication and commitment.. thanks for the post!